OWH Stars and Stamps (Our OLD blog! ): Inspiration from GinaK Designs! 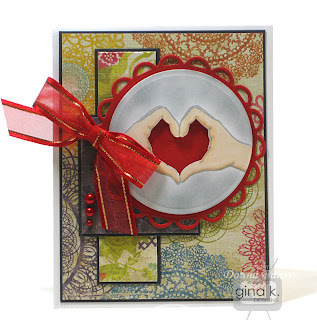 GinaK Designs has something really special for us today!!! One of their stamp designers, Melanie Muenchinger, created an absolutely beautiful stamp set, especially with heroes in mind. 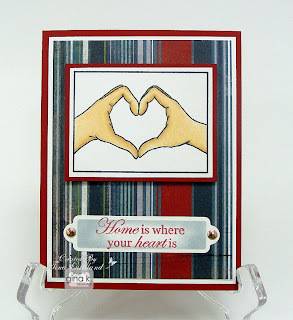 Melanie shared her thinking behind the development of this special set of stamps & sentiments. “I have been illustrating stamp sets and designing for Gina K Designs for three years, but I started stamping almost eight years ago. Those years of card making before I started illustrating were really valuable in planning out my sets and knowing what had been done before and what hadn’t. I love to experiment with new ideas and some of my favorite sets have been for stamps I haven’t seen anywhere else or feel like are “missing” from what is currently out there. "Additionally, I met some amazing women through stamping that had a different family life than my own, Beate Johns, Emily Giovanni, and Carolyn King, stampers who have several young children and husbands that serve in the military. This separates their families for long periods of time, often transplants them to different cities and their children to different schools, but they all handle it with such grace and I am so grateful for those who make sacrifices like these, it really inspired me to create a special set to honor them. "Shortly after I read a comment on a blog from a stamper who was actually the soldier, a mom who was in Iraq while her husband was at home with the children. This opened my eyes even more, realizing how much soldiers would also like to make and send cards like the ones I’d imagined for the set back home! I originally intended to call this set “Love & Service”, a set for making cards for heroes, and from heroes! But the set grew over time to include sentiments for people who serve in other capacities, clergy, nurses, volunteers, anyone with a servant heart, and then I found the perfect image that would convey love and thanks and still be appropriate for anyone to send to someone of any age: two hands forming a heart, a universal message of love. The finished set is called “Where Your Heart is” and is now available for purchase at Gina K Designs. 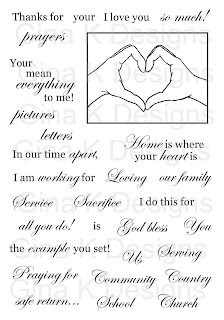 The sentiment combinations are practically endless: “In our time apart, I am working for us” “I do this for our family” Praying for our country”, “Your letters mean everything to me”, “Thanks for your sacrifice” etc. I will be posting a tip sheet shortly with all the ones I’ve come up with, but I’ll probably miss a few! I am thankful to our have our Gina K Designs Design team showing off some of the possibilities for this set so beautifully, and thankful to Gina for donating two sets today! 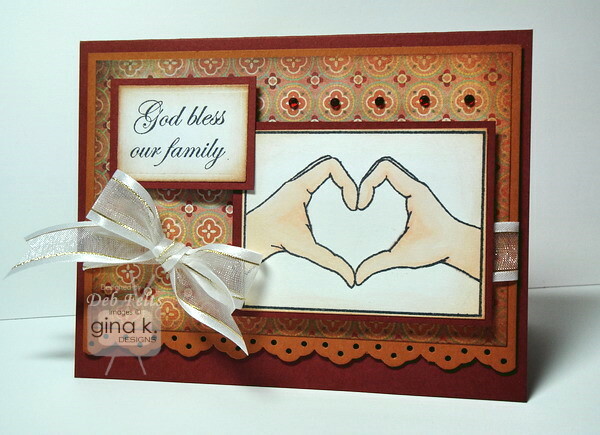 The GinaK Designs design team created samples with this stamp set to inspire us! Each designer's blog is listed below their card, so be sure to go see them as well. Read on after the samples to see how you could be one of two winners of this set of stamps to use for your OWH cards! There are two chances to win this set of stamps....one winner will be drawn from comments left here on our blog today, telling us why YOU make cards for our heroes. 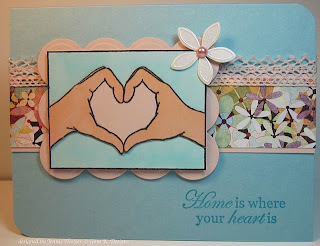 The other chance to win is by leaving a comment over on Melanie's blog, Hands, Head and Heart! Comments are open til Monday night, PST - and if you stay tuned here, Melanie might have an extra goodie for us right here on S&S too. Good luck! Being a retired teacher, I can't exactly "sign up", so I found this blog a long time ago and decided this is how I could do my part. Making and sending cards for OWH is just a little tiny bit of what I can do to "give back" for everything the troops do and what they stand for as well as sending cards to personal soldier friends who are serving over there. My brother served and he was able to come back to us. The cards bring the troops a little bit of "home" which is something they can send back "home" to love ones and friends. Thank you Sandy for posting today! I make cards because there is nothing like handmade! Now that I've fallen in love with the craft, I can't stop making them, and the process is not complete until you give that card away to be enjoyed! When you know how much one card can mean to one person, your heart just opens! I cna't imagine how much cards from OWH lift people's spirits! I will be sending lots of cards soon! Beautiful stamp set Melanie. I found OWH from an advertisement in a magazine and couldn't wait to start making cards for our servicemen and women. My Dad was in the Army and away from home several times due to wars. There wasn't a service such as this back then. My former husband was in the Navy...he never was separated from me and our kids but we were overseas for three years. I know first hand how hard it is being away from your loved ones. I am proud to be a part of OWH,to give just a little bit of love and inspiration to our troops and their loved ones. Every morning I awake renewed and itching to get to my craft table to make cards for them. I am so excited to see this post! Melanie has been a favorite designer of mine for several years and is one of the few stamp designers whose name and blog I know by heart! :) This set is perfect for our mission with OWH and yet so practical for our own personal stamping as well. I stamp for OWH because it helps me to focus energy outside of myself and to make a difference in the lives of others who need a reason to smile and deserve the warm feeling that personal communication from a loved one far away brings. This unique mission ministers to both the giver(s) and the receiver(s). I am blessed to give cards that bless our troops who then, in turn, bless the ones they love. Thank you OWH for giving me the outlet to do what I love and to be loved for doing it! Melanie always comes up with the perfect images, and this set will make it even easier to honor our service men and women through OWH and other means. these men and women leave their homes and their families in the name of freedom, and we can't thank them enough. if a little time from me, making and sending a card, helps them get through the day, then i'm all for it! I make cards for OWH because it allows me in a small way to say thanks to our servicemen and women who do so much for us each day. Without them what would our country be? This new stamp set from Melanie makes it so easy to make cards for them that say how we feel about them and in turn they can tell their love ones the same. Nothing says love like a Homemade card! I enjoy making cards for OWH as a way to give some joy and comfort to those serving so far away from home. Love the new set of stamps and will be ordering soon! What a gorgeous stamp set and lovely samples. I started making cards for OWH because I know that using handmade cards makes the sender and receiver stay in touch, something that can be difficult for deployed service members and their loved ones. Many of my relatives have been deployed, and I know they would have loved the chance to write home on a nice card and feel a part of the special occasions they spend overseas. Also, I love making cards but don't need as many as I can create. I would rather donate them to people who will appreciate them than let them sit unused. I have made cards for the military through our church card ministry. We have also in the past sent cards for the military to send home through the USO. I came here through Melanie's blog and will be checking out OWH. I do it because they deserve it for protecting our country. What a fantastic stamp set! I love the hands image. Making cards for OWH allows me to thank our military overseas for serving our country. It also lets me thank the families they leave behind for the sacrifices they too make. I have made cards in the past because I know how nice it is to receive some beautiful happy mail and our service members deserve to have something nice to send home. I am just starting to get back to making more for OWH. I make cards for a special lady in the military - my daughter. She is serving her country through the Army and is in Mosul, Iraq right now. I appreciate everyone's sacrifice to keep our country free. I feel making cards for OWH is a small way of saying "Thank You" to the troops and their families for all they are giving up to help make our country free and safe. They certainly are heros! I love making cards for OWH, it makes me feel good that I am in a small way contributing to our soldiers being able to keep in contact with thier families. It is my way of showing that I support them for fighting for our freedom. Melanie has done a fantastic job with this set, it is on my wish list. I make cards for OWH because when my husband was in the Army, contact with him was so very important and these cards make it easier for those in our service to write home to their loved ones. What a beautiful stamp set! I make card for heroes because I was lucky enough to have a father in the services who never was deployed. My brother served a short time in Afghanistan, and I know that if OWH was around it would have made it easier on my famliy at the time. I make cards for OWH because it a small way that we can let the troops know that we support them. It's important that they stay in contact with family and friends to keep them all connected. I have several grandsons serving and know how important that contact is for all of us. what a beautiful set...PERFECT to create cards for OWH! Way to go Melanie and to OWH for helping to make the lives of our troops a little easier to bear. I make handmade cards for enlisted, because I know the joy I get from receiving a handmade card. I only hope that it's double excitement for those that receive a card from their enlisted family member. 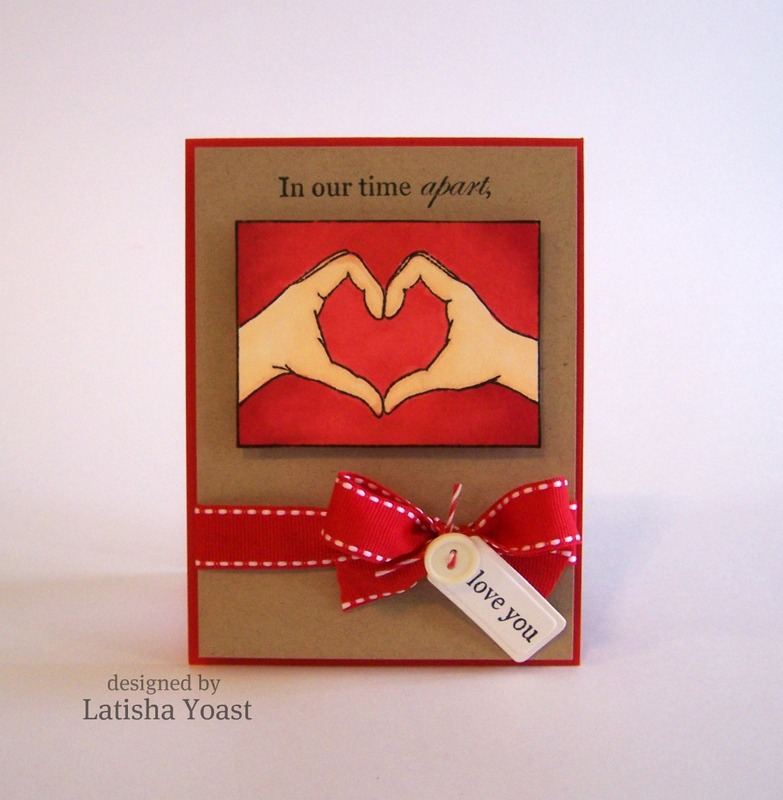 NOt only hearing from their loved one, but also getting a card made by hand and from the heart! What a beautiful stamp set. I'm looking forward to seeing what Gina K comes up with in her videos with it. I make cards for OWH because it's the best way I feel I can serve our military men and women. Not to mention the wonderful people I've met! I love this set. I make cards for Operation WELCOME home in Maryland. This is a group that meets soldiers coming home from overseas. Thank you for your support for our military. My son is currently serving in the USAF. My brother is part of the USAF. He has been deployed many times and is leaving again next week. Each time he leaves behind his wife and three daughters. What a great set, not only for cards for him, but for his family and to donate to him and his fellow soldiers to send to those that they love who are left behind at home. 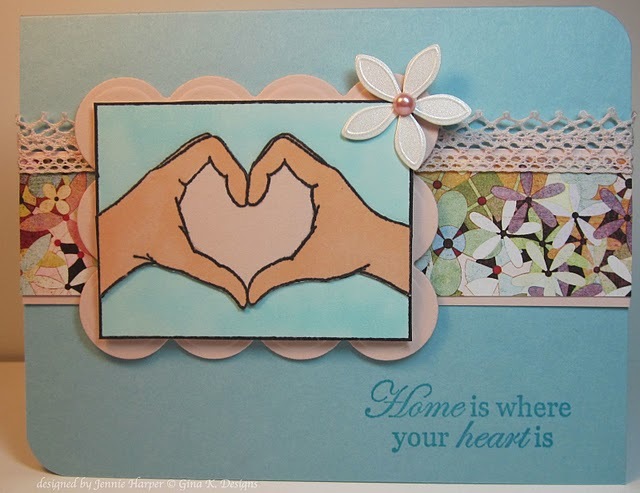 I love making cards and I love to share them with Operation Write Home. It is a great feeling knowing that my cards might help bridge that gap between a soldier and his family. I always knew I would volunteer when I retired, but being able to give such a wonderful gift to our soldiers overseas and their families in the form of handmade cards for every occasion and to grow creatively at the same (hadn't really made a card until Jan. 2010) has been a double blessing. I love devoting one day a week to such a wonderful cause! When I first started making cards for OWH, I was just having fun, but then after reading the letters that came to us from the troops, I sat and cried knowing they appreciated them so much. They did sit down and write a note to home where they didn't do as much before. I am honored to be apart of this program and continue to make card for our troops. OWH is such a wonderful organization that I feel I'm a small part of it but just as important. 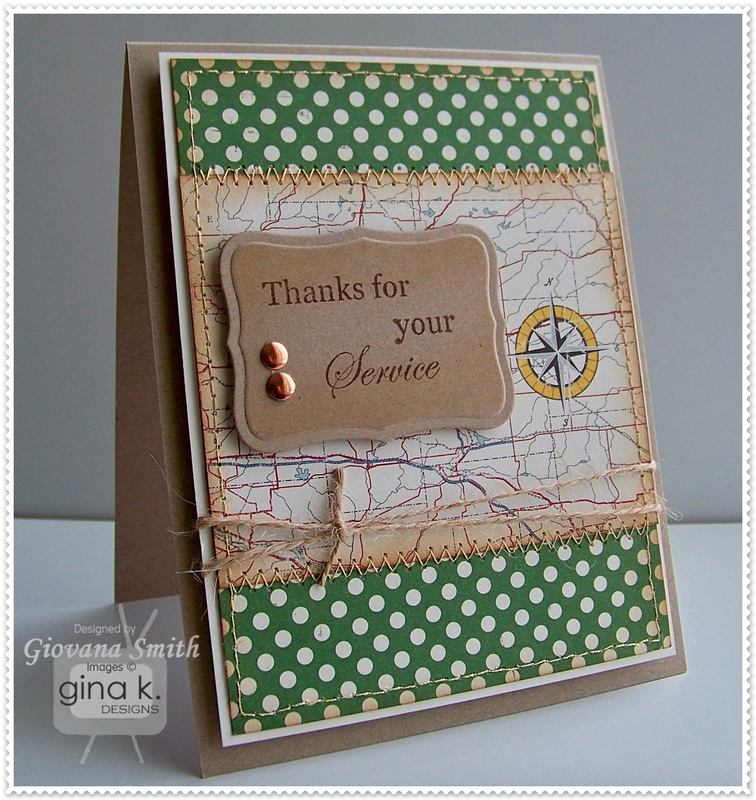 Thank you Gina K for giving all of us this opportunity to win one of your awesome stamp sets! Beautiful stamp set! Being a military spouse, I know how much a card can brighten your day when you haven't seen your loved one in months. I love making homemade cards for the troops knowing that it will be appreciated by both the sender and receiver. Melanie has designed many lovely sets, this is the best yet! And I love how you let her tell the story! I'd love to win, and although I've fallen a little behind in making cards for this project this past year, I hope to get back into it more again. Now that I'm a survivor of breast cancer, these two groups gets lots of cards for giveaways from me! Thanks for this chance to win! I do it for all of the families like myself because a card from my husband meant the world to me when my husband was deployed. I make cards for OWH because with a husband in the military, I understand what a comfort something as simple as a card is to not just the person receiving it, but also to the soldier who sends it. I make cards for OWH to thank the people protecting and serving our country. My husband is retired military so I know some of the sacrifices that they make and want to make their job just a little easier. I recently found out about OWH and sent off some cards for the holidays. I didn't get to send off VDay cards due to a very busy holiday. However, I love this set and would love to create more cards for these brave men & women who serve to protect us. I plan to start working on Easter cards next. This is another big holiday that many will miss sharing w/their families. I have enjoyed making cards for many years, but when I discovered OWH, I realized I had a bigger purpose for making cards. My cousin received OWH cards during his deployment and has told me how important they are to the morale of the troops. My dad is a retired Marine, and I remember what it was like when we got mail from him while he was deployed. So I like that some of my cards might bring a little light into the lives of those family members back home who are waiting for their sailor, soldier, airman, or Marine to come home. It's also a fun and meaningful (I hope) way to share my hobby with other people. And service to me and you. Until they come home some day! What such a beautiful stamp set, Melanie! I love your creations! I read your writing and felt so much warmth in my heart. When I started making cards for our troops two years ago by participating in a Cards for Heroes Drive, I was very new but I was so thankful for what I can do for our troops as a small token of my sincere appreciation for their services so I kept on going. I met a lot of great people and made new friends through cardmaking for our troops. Very grateful! i send stacks of cards to my nephew in afghanistan and he shares them with his buddies. they love getting them and sending them! Canadian Armed Forces has a link on their website where we can send cards, care packages etc to our soldiers. It is such a great idea. We can even send gift cards for Tim Horton's coffe shops they have on base! Technology is amazing, the troops can video chat with their loved ones...but it is nice to send a card that is tactle. A card that a soldier can sign with a kiss send to a loved one back home is something the family can hold on to until they come home. I love, love, love this stamp set! It's so perfect for OWH and I see many other possibilities with this awesome set. Thanks so much for the great design and all the wonderful ideas from the designers. I am really looking forward to making some cards for our heroes (my Army son included). My brother served overseas & said there were men & women who went their entire tour without getting any mail. 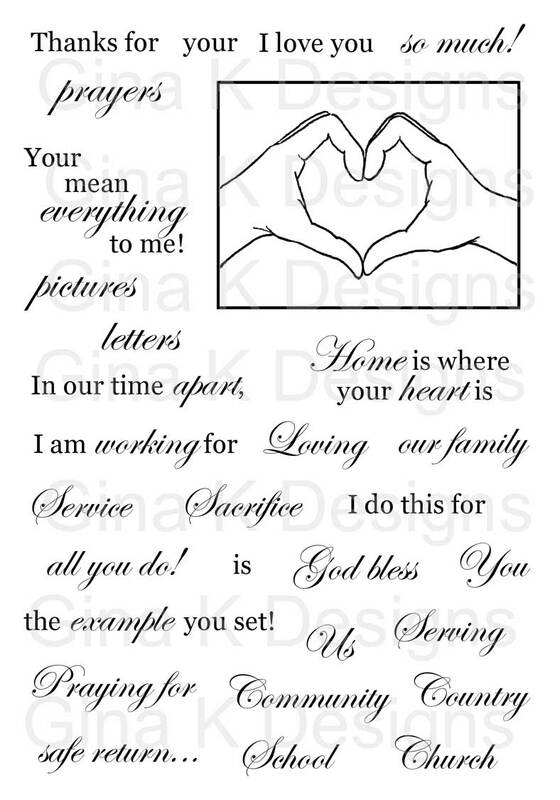 It's so easy for me as a paper crafter to send make cards for our service men & women. Big thanks to the volunteers for "Operation Write Home"!!! I make cards for OWH because a little over a year ago, I received a Cards for Heroes card from my daughter who was deployed to Iraq at the time. Though my daughter has been home for 9 months, i still take that card out and reread it. It meant so much to me, that I want to help all the families of deployed soldiers receive something so special. This is such a beautiful set, and perfect for OWH. I love all the examples put out by the design team too! As a stamper, veteran and military spouse I can connect to all sides know how hard it is to be apart from loved ones and how important it is to remind them you care. I guess I need to get over to Gina K's to check all the new releases. This is a wonderful set Melanie. How amazing is this stamp set!!!! I love it!!! And would use it to make tons of cards for our troops!!! So many different ways to use it!!! Amazing!!!! Those who serve in the armed forces sacrifice so much for those of us back home...making cards for OWH is just one small way that I feel I can express my gratitude for all that they do. Love this new set, Melanie!! I too make cards with some fellow stampers for the troops but have not made any for OWH. My neighbor behind me, a fellow stamper, has 2 sons serving in the Army. We make cards, package them, and send them back with her sons. They are so appreciative. I also have a nephew who is a chopper pilot soon headed to Afghanistan leaving wife and baby behind. We all owe them so very much and this is a small token of our appreciation. I grew up an "Air Force Brat" during the Vietnam War, so I know all about the sacrifices of service men and women, as well as those of their families. Making cards of OWH is only one way I can show my appreciation for the sacrifices they are making for my freedoms. This is an awesome stamp set! I make cards to send to our heroes also. Some have hand written messages, others are left blank so they may send them to their loved ones. My brother was in Iraq and found it difficult to purchase cards for birthdays and other holidays. I hope the cards I make are nice for them to send home to their loved ones. From what my brother told me, there are so many soldiers who do not get mail. How sad! Melanie's set would be wonderful for Valentine's day. I was in the military, and have many family and friends in the military. Reading this blog made me cry. A soldier should never feel alone, or that no one cares. A volunteer should always be given support and appreciation for their efforts. This is such a perfect stamp set which will warm many hearts and bring a wash of comfort to many who need it! Thanks Melanie - rest assured your stamp wet will make a difference in a lot of lives, with our help! Right after I straightened up my craft room and finally got it organized enough to use, I discovered exactly how much stuff I have. There is no way I could ever use all the products I had in my stash. About that time, I discovered OWH. PERFECT. What better way to use all the supplies I have and show my appreciation for our men and women fighting so that I can have this beautiful home and a room to play in. I've told everyone I know about the project and would love to add this beautiful stamp to my collection. Thanks for the project and thanks for the chance to win this amazing stamp. My brother served in Vietnam and I know how much letters meant to him while he was so far from home. When I think of the wonderful men and women who are serving our country now, I get choked up just thinking about it. The least I can do to encourage them is to send cards and letters to those who might not otherwise receive much mail. These stamps are amazing, I get together twice a month with some gals from work and we make cards for the troops, it's a lot of fun, and we all get a great of of satisfaction from doing it. Can't wait to get a set of these stamps and have fun with the gals. This is the first I have heard of this wonderful project to send cards to our wonderful troops to send to their loved ones. I have a son in the army, who is very happy to be serving, and two grandfathers that served in the military as well;I am very proud of them.I am happy to do anything to make my son's and other's lives easier. I make cards to share with others and for no other reason. I am not sure of how much they like them but I love sharing with them, in hopes to make their day just a bit lighter. I made cards for heroes because I am medically unfit to serve myself and appreciate their service and sacrifice. My husband is an active duty member of the USAF, so I know first hand how important ties with your loved ones at home are, and how great it feels when you are able to receive a card for your deployed hero. Thanks for this wonderful organization and for the chance to win!! I; too LOVE to create cards. I've always got a project going. I've not been involved in sending cards to our soldiers. I don't know why. But I intend to start now. What an inspiration to all of us. I make cards for our soldiers overseas as my small part in supporting them and their families until they can all come home. This is a lovely set of stamps that would make great cards for the heroes overseas. I have a stack of cards ready to mail off to OWH but didn't get them out last year. Part of my crafting resolution is to send more cards for others to use. I think it's so important that we pay back those who are are keeping us safe and strong. This would be an outstanding set to use for cards for heroes. I love creating cards. I think it is something that I can do well. I made cards for Operation Write Home because I feel that it is very important for us to help our soldiers and their families as they work so hard and give up so much for us. Military service in each generation of my family goes back to WWI. My father was retired military, and I watched my brother and my cousin serve in the late 60s. Currently, my grandson is a Marine who has served 2 tours in Iraq. Because of his suggestion, I have made cards and sent them overseas with various groups that put together care packages for our service people, but am now thriled to find out about OWH. I love Melanie's stamps and this set is so wonderful. It's on my wish list, and OWH can depend on me for cards on a regular basis. I love the idea that soldiers will be using the cards to send home to family/loved ones and can stay connected with loved ones far away. Fantastic set! Perfect for our brave service men & women. There are 16,214 members of stamp TV - If we all send 5 cards to OWH there would be over 18,000! Let's do it!!!! This is such a wonderful site! I will start right now making cards for our service people and their families! We can not Thank our Military people enough!!!!!! I enjoy being a small part of OWH and so appreciate the opportunity to send cards for the troops. It is a privilege and an honor to serve those who serve our country. This set surely expresses our heartfelt thanks and is a way to thank others as well. Thanks Melanie for following your heart in designing this one and Gina K for donating it. I am a relative newcomer to OWH. I found the site-quite serendiptiously- while stuck at home after an accident shattered my elbow and clavicle. I was going nuts not doing anything! After I found the site, I realized I could probably make cards with one working arm! I started last spring-had a few interruptions along the way for more surgeries-and now my arm is almost back to normal. Finding the OWH site and making cards for the men and women who are sacrificing SO much for us was the best therapy ever. and I'll continue because, for all intents and purposes, OWH gave me my life back. Thanks. My sister works at the local Walmart and was involved in making cards to send to a specific group of soldiers they sponsor. I had the privilege of helping her make cards of thanks and encouragement to send to them. 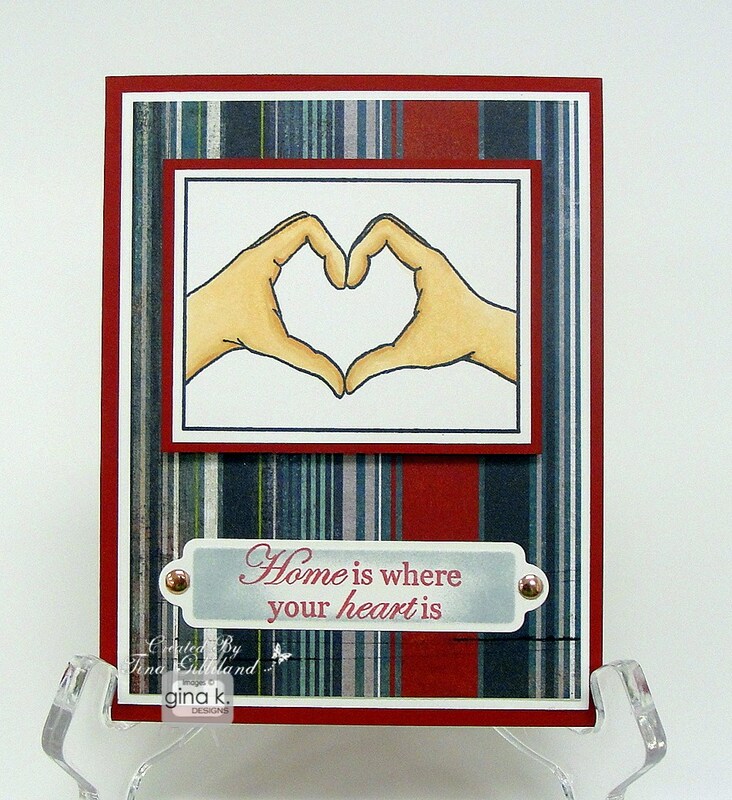 We were able to find some stamps with military themes which we used for this project, but I am so happy to see this set that you have created. Thanks for creating something with our military families in mind! I make cards for OWH because life is short. Miles separate loved ones and people need to know they are loved and thought of. A handmade card from a beloved soldier is a wonderful gift for anyone waiting on the other side. To make cards for those that serve us in whatever capacity is a true gift of sharing from the heart. OWH is a great site to encourage this small act of caring. I have been creating cards for many years and since retiring I've been searching for a way to share with others. Through Gina K. Designs, I've found OWH. What a beautiful way to serve and follow the teachings of Christ! I am bookmarking this blog and will begin creating today! I have ordered this stamp set and can't wait to use it! I have many family members active military, plus I like to contribute to outreach projects with my church and my employer. 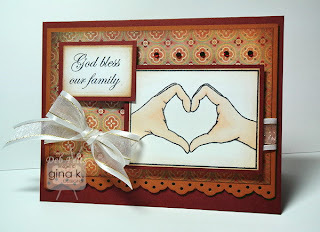 I love to make and give cards, and this set is so pertinent to show real appreciation. I love it! Just sent 360 cards for OWH to Sandy Allnock in Washington and working on the next set to send. A small act of graditude is so abundantly meaningful to those who serve and sacrifice. What a thrill to create with your own hands a token of thanks to be received by the hands of one who gives day after day for our safety, security and freedom. As a teacher, I had my students make holiday cards for soldiers in November. I didn't know about OWH, but now that I do, I'll add this for my students. 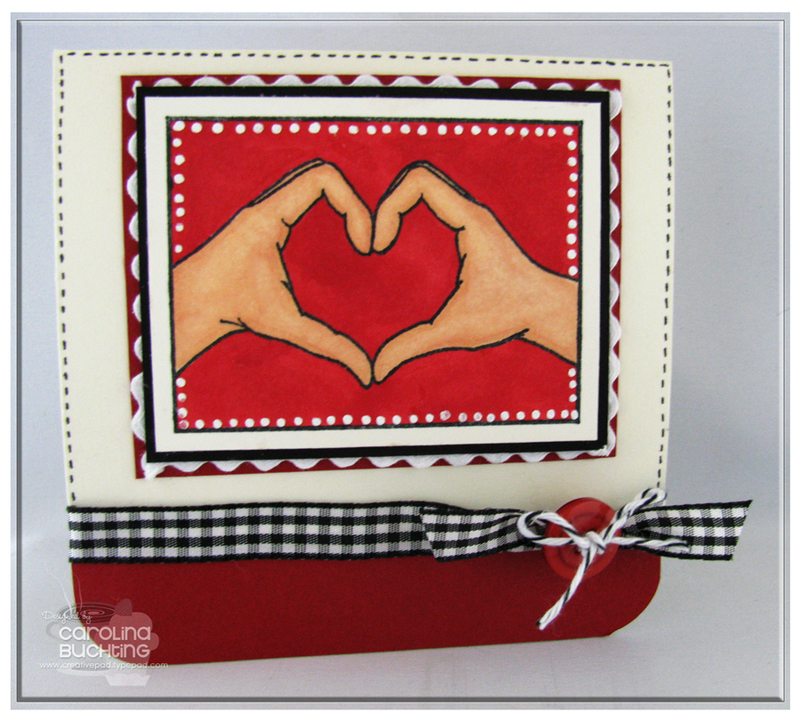 We were planning to make Valentine's day Cards and the stamp set you have designed is perfect for this. Thank you so much for your creativity. We often go through our busy days and forget the soldiers. My next door neighbor is in Afghanistan and they appreciate everything we send them. I have family and friends that have been in the service. This set is just awesome. Thank you for sharing your story and for the wonderful gift you have given us in your stamp set. the reason i make cards for our heroes is that i feel it's the least i can do for all they are doing for us. i have been sending cards to two different organizations for several years. (both cards for the heroes themselves and cards for them to send home to family and loved ones. this set is awesome, thanks for a chance to win it! um. the previous anonymous comment is really from me (tpatti@windstream.net( sorry i forgot to add it to the comment. I make cards for OWH because we come from a strong military background and I make them as a memorial to our young niece Rachel Bosveld who was killed in Iraq and buried on what should have been her 20th birthday. Rest in Peace Rachel, we miss you still. Our Boy Scout troop makes cards every so often for our troops overseas, and stateside. This would be a wonderful set to use in that project. What wonderful sentiments! love that Gina K set!! so many possibilities! I make cards for OWH to pay it forward. When my friend Heather was stationed in Iraq a group of "Red Hat Society" ladies in Michigan adopted her and sent her blank cards so she could write home and send thank you notes for care packages. I want to do the same for other soldiers as a thank you for all they sacrifice. I create cards for our heroes for a couple of reasons. I love creating the cards and I don't send many out (I know, I know, I should). Also, I want our heroes and their families to know that we appreciate their service and sacrifice. Melanie, thanks so much for the heartfelt reasons for designing "Where the Love Is".It is such a beautiful set. I don't know anyone personally that serves but love to contribute to the servicemen and women whenever I can to show how much we support all their sacrifices they make for protecting our FREEDOMS! My father served in WWII and the Korean War and my brother served in the Navy for 8 years. I send cards because I have 2 sons in law who serve. Fortunately we have never had a period of time when they are both gone, but all those who serve are heavy on my heart, each and every day. I am moved by their willingness to be apart from family and friends facing so many unknowns and danger. I want them to know we care and look to them as heroes. I make cards because my son is serving in the Air force just like his dad and both of his grandfathers did. With out these brave men and women we would not be free. I want all of our service men and women to know that they are heroes and appreciated. Thank you Melaine for this beautiful and thoughtful set. My son is serving in Afghanistan and it warms my heart to see how may people really care. Bless you. This is such a beauty. I make and share cards because I know how much I love to receive cards, and I'm not putting myself on the line everyday for my friends, family and nation. Anything I can do in my way to help our fantastic armed forces members stay connected with their loved ones and hopefully bring a smile to their faces, I've gotta do it :). Have a nephew in Kuwait and know how much they appreciate receiving mail. Saw pics on OWH of soldiers receiving the boxes and going thru them, smiling and holding up cards that they picked out. Really touched my heart. Have been sending cards to OWH for about a year and hope to continue to as long as I can physically do so. And God Bless OperationWriteHome and all involved in it!! 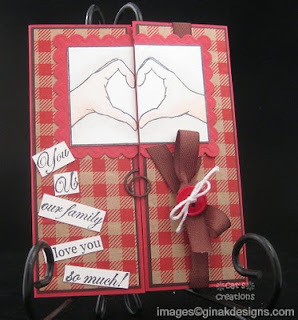 I am such a card maker and enjoy all types of cards. But I especially like the idea of helping a military person stay in touch with their love ones back home. It is so special to be able to send a "birthday card" to a family member instead of just a piece of notebook paper. It is my little bit that I can do to support and let our defenders know how much I appreciate the sacrifices that they are making for us at home and our country. I heard about this site from a friend. This is my first visit. I have a son in the Navy that is a Corpsman and will soon be training with the Marines. I plan on making some cards for this cause. This stamp set is just wonderful. I would love to acquire a set! Thanks for a chance to win a set. I learned about OWH at the same time my grandson went into the selection process for Special Forces. Wouldn't it be great if someday he would be able to send an OWH card back home. Thanks Sandy and your team for all that you do. I have just recently found OWH and hope to be able to contribute soon. I LOVE Melanie's new set for so many different reasons but letters for OWH will definitely be the first place it will be used. I love your stamps, Melanie, and this one is just perfect. I've been wanting to do cards for the troops, so this couldn't have turned out better...... What a way to start off the New Year!!!! I make cards for our Heroes because it gives me great satisfaction and it's comforting. I come from a military family and my son is in the Army and is getting ready to go back to Afghanistan for another tour! I make cards for OWH because I am a Patriot, an American, a child of Americans both immigrants and Native, a Parent of Americans (truly---they are such mixes of heritages). I make cards for OWH because If I wanted to be, I could be "A Daughter of the Revolution". I make cards for OWH because I am a daughter of a WWII Veteran(Navy), RIP (gone now going on 6 years), niece of a WWII veteran(Army), injured quite seriously during "The Battle of the Bulge"; a recipient of the Purple Heart, now also passed on. I am a wife of a Veteran(Navy), Step-Mom of a Veteran(Navy),my late BIL was also a veteran (Navy) and my daughters have dated a couple of service men, one was engaged for a while(Army). the other never reached that status but they were together for over 3 years and are still good friends(Navy). I have several cousins that are veterans, and some still serving. I make cards for OWH because I can, because they are doing what they do, so we can do what we want to do, and because they try to help other nations have the rights that we do. I make cards for OWH because I want to, because I am proud of those that serve, as I am disabled and can not(and older now also, LOL). I make cards for OWH because it is the right thing to do, a good thing to do, it is the LEAST I can do, and I do it with my heart. I may not make as many cards as some of the other gals, but I do what I can. All 4 of my limbs are compromised, and I have spine issues also. I create when I can, and 90% of all the cards I make are for OWH. I am PROUD to be able to say all of those things, I am PROUD of OPERATION WRITE HOME. I am PROUD of all the people who make the cards, the people that ship the cards, the people that pay to ship the cards, of organizations and companies that support OWH. MOSTLY I am PROUD of the initial recipients of our cards, and also PROUD of those they are sent home to, as I know the sacrifice they make. Thanks Gina K for a remarkable stamp set, and for donating 2. Thanks for the opportunity to win one. What a wonderful stamp set. I make cards for OWH because I have friends with family that are in the military, because I have kids that have friends in the military and because one day I may have children who will also serve. I know the thrill these men and women get when they receive a box of handmade cards, but I also know the thrill that the family members back at home get when they receive these handmade cards and it thrills ME to be a part of such a fabulous organization. Thanks Sandy for everything you do to keep this going and to the shippers that work tirelessly to get these shipments out to the troops. I am a disabled veteran myself and have been deployed away from my four children. It would have been wonderful if these cards had been available then! I know first hand how much it meant to my children to hear from their mom and I want to help give all of our troops the opportunity. I make cards for OWH because I am a disabled veteran and a mother who was deployed away from her child. We wrote often and I know how important it was to keep in touch. My son loved the cards I would find and send him, and I sure loved seeing cards from him. I was able to buy cards to send my son, but there are no BXs for many of our troups to shop at. I also want our troups to know we care. Wonderful designs for all the right reasons! Thanks! What a perfect stamp set for cards for the troops. Thanks! I make cards for the troops and their families because ever since I can remember and before someone in my family has been serving somewhere. They all deserve all the thanks we can give them. First- WOW - what a beautiful set! Second- why do I made cards? Because I can! It is something I can do that might just make a difference in one person's life. I can only imagine being away from those you love like our heroes and their families are. If I can make even one moment less difficult, then I will make a million cards! I think will all of the texting and emailing it is a special thing to get a hand made card saying we are thinking of someone. I also get the joy of making the card it is a win win. What a great design and all the great sentiments that make it so versatile. Beautiful! Beautiful! What an awesome stamp set. 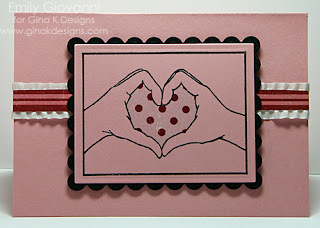 I absolutely love the heart with the hands, and all of the sentiments are fantastic. They work in so many different ways. You are pretty amazing to have come up with this design. I am retired from the police department and I know how much it means to me that I was appreciated each day so when I retired I decided to do some volunteer work and made 500 cards for the troops and they were put in Christmas gift boxes from the city of Cleveland, TN. After that I found out about OWH and since then I make over 100 cards a month to send out. I know several guys who have served over in Iraq and they are blown away by the generousity of the American people. I can't help physically but I sure can fill their lives with smiles. This is so beautiful and thoughtful. We can never repay the millions of brave men and women who have served our country in peace and war. Thank you. I make cards to let our heroes know that they aren't forgotten while they're serving our country. I want them to know that I care and this is a small way that I can show them. I also make cards to be an encouragement to the families of the heroes who will receive the cards from their special heroes. I like to pray for the heroes and their families as I make the cards. These brave men and women are risking everything for me, my family and my country. How could I NOT make cards for them to stay in touch with their loved ones? My son and grandson both have served in Iraq and Afganistan, and I know how important it was to hear from them. I pray with every card I make that my small effort will bring someone great joy and comfort. my dad in WW2, and many of my classmates and friends fought in VietNam. My husband was in the Navy but never deployed. Two of my daughters were in the USAF and my son was in the Army and served in Iraq. Many of friends have children and grandchildren serving in the military. I just attended a funeral for a friend's son who was killed in Afghanistan the end of Nov. Our servicemen and women are giving their lives to fight for our freedom, we need to let them know that we appreicate them and think about them. This set is a beautiful way to do that. I want the members of my 4-H club to realize that men and women are serving in the military and fighting for our freedom and it is not something to be taken for granted, so throughout the year we make cards and send them to our servicemen. Why? The short answer...my son-in-law is in the navy, and my son wants to join the air force. Long answer...helping others is part of what life *should* be about. Putting out a small piece of art, and letting that art help soldiers stay connected to home, and home to them, matters. 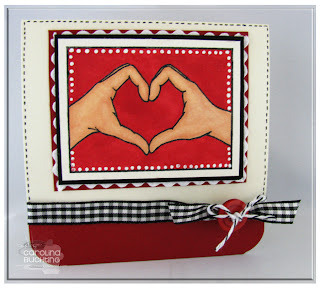 What a gorgeous stamp set, really love the cards that have been made with it - so versatile! What a wonderful service you are providing our service folks! I make cards to send "to" service people; now I'll be expanding to make cards for them to send home. I really appreciate knowing the background, too, of the designer of this stamp set; love it and hope to purchase it. This is truly an awesome set! I got started making cards to help my sister (Annie M) out. She needed help putting kits together for a group of ladies who get together once a month to make cards for OWH. When I started she said "welcome to the addiction." At first, I didn't know what she meant, now I do! Ideas are constantly running through my mind. This is a great creative outlet for me. I know I would have like to have this service when I was in the Army and I am glad I can help a fellow service member keep in touch with loved ones! This stamp set is fantastic.... I was so excited when I seen it previewed on GKD!!! Making cards for the soldiers is just a small (very small) way to show my support & how grateful I am for all they do/sacrifice to keep my family safe! What a wonder set Melanie created to thank all those who serve our country and volunteer their time to help others. I mark cards for heroes because they are so deserving for all they do. They sacrifice so much in their lives to keep our country safe. I make cards for OWH because I love this hobby and I love sharing my talent with others whose talent keeps me and our country safe and Free! Love this set! I got involved with Operation Write Home through a friend whose son has been serving in the middle east for the last 7 months (he came home last week--woohoo!). I love that I can do something that I love and help support our soldiers at the same time. I was even more pleased when several of my students showed up to help make cards at our last party. Their excitement to be a part of OWH was a joy to see. This is such a beautiful set. I can't wait to get mine in the mail! Thank You Melanie for what a beautiful set to serve all who serve. I am so glad to have found OWH over two years ago as it is my way to serve and give back to the military. The cards benefit three groups-the cardmaker that makes them, the service member who is able to write home and the family who receives mail from their service member. Thanks for this opportunity to win this beautiful and appropriate stamp set! The reason I make cards for our heroes is for the very reason that they ARE HEROES! They sacrifice so much and if I can do anything to help them or their families, I'm glad to do it! Thanks for making this organization and it's purpose!